← Packing for 13 hours in an airplane. No pics on this one I’m afraid, just a short story. Thursday night (our “Friday”) we went with 5 of our friends to the Old Souq. It’s a pretty standard thing to do if you’re ever in Kuwait, and we’re glad we went. We wandered around a bit and eventually sat down to eat dinner at one of the common food places there. Fun fact about eating in Kuwait: restaurants fight over you, so guys armed with menus try to recruit you to sit at their tables if you even pause anywhere near the food area. It makes you feel special. Anyway we ended up ordering some saffron rice, hummus, some sort of small shrimp dish, some sort of small chicken dish and, because there were seven of us splitting it all, we ordered 1.5 skewer plates. What they brought out to us was a delicious mountain of food. We ate for an HOUR STRAIGHT. They served us fresh Iranian bread in giant baskets and brought us new baskets whenever ours got cold whether we had finished it or not. Iranian bread is amazing. Someone remind me to post a picture and blurb about our Iranian bakery that’s close by. We left with bags of food and plan on having a reunion feast on Saturday. After dinner we rolled walked around a bit more and our friend brought us to a carpet place called Hussain and Ali’s. Hussain happens to be an Afghani carpet salesmen educated in Iranian literature and one hell of a storyteller. 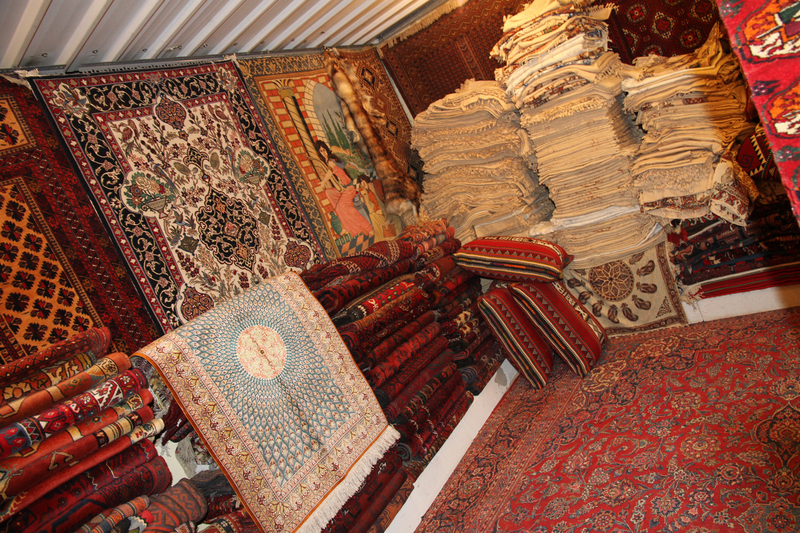 He brought us into the second floor of his shop and proceeded to tell us everything there is to know about carpets. For two hours. It was amazing. He taught us how to count threads, identify & define Muslim symbols within the carpet, and determine whether the weaver was left or right handed. How cool is that? By the way, should any of you ever be in need of a carpet consultant, we may be of some service. As for the week ahead – we’ve got some blog posts simmering. Until then you can amuse yourself by price-checking authentic Qum (city in Iran) silk rugs of 1.5 million threads or more. Do it. It’s nuts. An artsy shot of the store. Carpet for dayyyyys. Thanks to Lindsay for the picture! Let me know if you are ever served Iranian rice. It has dill, potatoes, lima beans and of course rice. Two different people from the old Iran gave the recipe to me and we love it. So how is school! Thanks for sending this. It is the most interesting part of any week! Let’s just say we could teach Patrick a thing or two (or eight) about carpets now.